Hallux valgus or skewed big toe is a condition in which the bone at the base of the big toe slowly shifts medially and a bunion is formed. The big toe begins to point towards the other toes, and at times it may become so bad that the big toe overlies the other toes. Over the bunion the skin is usually irritated and a wound may develop. The condition itself can cause osteoarthritis. Skewed big toe is most commonly seen in women and narrow shoes, and hereditary dispositions, are believed to increase the risk of the disease. When the big toe starts to turn towards the other toes, and a bunion develops , there may be varying degrees of pain. Many patients experience swelling, redness and pain of the basic joint . People who have osteoarthritis of the toes, can experience great pain from the big toe. If you have problems with your big toes and have recently observed that your big toe slowly changes position you should consult your doctor. Your doctor may refer you to an assessment by an orthopaedic surgeon, which will take an X-ray and assess the degree of malposition of the big toe as well as determine if you have developed osteoarthritis. Moderately changed position of the great toe is common and should not be treated. If you have problems and pain, you should not use narrow shoes, which can exacerbate the condition. A splint may keep the forefoot and thus the great toe in place and prevent the need for operation. In bad cases an operation may be required. There are different methods of operation, but common to them all is that they address the position of the great toe. Hallux valgus may be associated with inflammation of the joint between the basic bone of the big toe and the rest of the foot, which can be very painful. 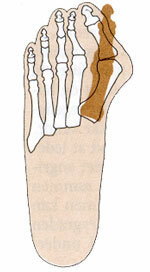 If the great toe is malpositioned there is an increased risk of developing osteoarthritis of the toe. Operation is relatively frequent performed, and the prognosis is generally good. Following the operation, you must be prepared to wear a "boot" for approximately 5 weeks, which supports and relieves the toe. If your work involves a lot of walking you should be prepared to be off work for 5 to 6 weeks after surgery. People who are predisposed to develop hallux valgus should avoid wearing very narrow footwear. As it is often difficult to explain why the disease develops, it is also difficult to prevent.